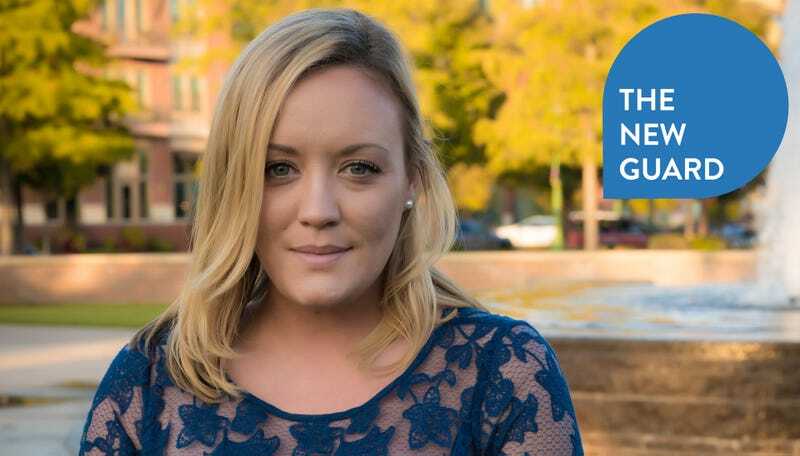 Linsey Fagan decided to run for office in 2016 as she watched the ascent of Donald Trump. She had been, as she puts it, a “total Bernie [Sanders] person, crazy Bernie person,” and acted as a state delegate in support of Sanders’ eventual losing campaign. Before the final ballots were cast in November, she was set on running. And after Trump won, she knew she’d made the right decision. One of Fagan’s top priorities is to get corporate money out of politics. Her other priority is to get her opponent, Republican Rep. Michael Burgess, out of office. Burgess, who represents Texas’ 26th Congressional District, has held the job since 2002. Among many bad things, he was at the center of the Republican effort to dismantle the Affordable Care Act. Fagan had her daughter Venice when she was 19. To say it changed her life would be a gross understatement. (Venice was hanging out at the campaign office when I visited.) She utilized WIC, Pell Grants and Medicaid to begin a life for herself and her daughter. She gets how valuable these programs can be to vulnerable people. “I’m just a girl that lives here,” Fagan told me. And maybe that, along with a Justice Democrats endorsement and a dedicated ground game in a more conservative district, will be enough to win a solidly Republican district. I just got really tired of seeing the same type of people that I felt were really detached from the reality of what normal people, middle-class, working-class families, are feeling dealing with. I think we need to get back to the basics of just taking care of people, and electing pragmatic leaders that will get things done and not grandstand and always vote 100 percent of the time with their parties. I think we have to elect people who operate in right and wrong. And I don’t really see a lot of that. You mentioned your daughter influenced your decision. If I didn’t have my daughter, I don’t know if I would have run, just because my job as a mother is to make sure that she has a safe world to live in and that her life is safe and her future looks bright. I was like the ultimate party girl before I had her, the wildest of wild childs. And so when I had her, I remember looking at her as a little baby and thinking, “I have no idea what I’m doing, but I’m going to make sure you have the best life.” And I think that’s exactly how I feel about running. “I don’t know what the hell I’m doing, but I’m going to make sure the people here have the best life.” And I think that people meet me and they know I’m telling the truth about that. I was a teen mom. I got pregnant when I was 18, and I had my daughter when I was 19. Early on I used Medicaid when she was a baby, and I know that whole process is pretty painful. It needs to be easier for people, especially in Texas. And then I had WIC. And then I got Pell grants because I got good grades and I was a teen mom. I had all of my community college paid for by Pell grants. And it wasn’t a crazy bill or anything but still. For me it’s great that I got my school paid for, but I think that in a lot of ways it’s not fair to my friends that didn’t have a kid when they’re 19 years old. Why do they have to pay for community college while I didn’t? I understand the cards were stacked against me, but expanding the Pell Grant program would be incredibly easy to do. We need to expand some of these programs that I think are only meant for people in really dire situations. We need to expand them to the middle class right now because the middle class is not doing well. And the middle class doesn’t feel middle class to most people. I would argue the middle class can be a dire situation now. I mean, I talk to families making 80, 90 thousand dollars a year and they cannot get by. They’re barely getting by. That’s crazy. They’re paying a thousand dollars a month in student loans; they’re paying a thousand dollars a month for insurance, child care. Nobody is thriving. I’m running in a very well-off affluent area compared to the rest of the nation and nobody I talk to feels like they’re thriving. For a lot of progressive candidates, healthcare has kind of become a central issue, but for you, it’s really corporate PAC money. Could you talk about why that’s the driving force for you? It’s the betrayal of the American people. These representatives have betrayed us. These people are not, “Oh, you know maybe they made a couple bad decisions.” No, these people are cowardly. They are working to hurt us, and they are, at the end of the day, just being bought out by the highest bidder. I’m not afraid to call that out when I see it and I don’t even care [in] what party the corruption is happening. And I think that that’s what people want in a representative. I think that everything stems from the money that these people are taking. And if you really just look at any of the issues we’re facing, “Oh, why would they be voting like this?” “Well, it’s ‘cause they get money from here.” We can say as Democrats, we want affordable healthcare. Well, we’re not going to have affordable healthcare until Democrats stop taking money from pharma and from healthcare. How are you going to fight for people and against something when you’re being bribed by the people that are benefiting from that? I’m really, really passionate about healthcare, but I think that if we want to take on healthcare, Democrats are going to have to stop being hypocritical about where you take the money. How hard can you really fight when you get $20,000 from Pfizer? You know what I mean? The next biggest priority for you is affordable healthcare through Medicare for All. Of course these things are possible. Every other country does it and you guys are not batting an eye when we spend a trillion dollars a year on war. Why bat an eye when we want to spend a trillion dollars a year on Medicare for all? Destabilizing the Middle East isn’t really good for our country, but Medicare for all would be. Having healthy citizens would be a game changer for us. Nobody bats an eye whenever Republicans give tax cuts to corporations and the top .001% for two trillion dollars. Why are you batting an eye on a trillion dollars for healthcare for people? Not to mention for me I don’t care how much healthcare would cost, I really don’t. We were given life, liberty and the pursuit of happiness, the first of those being life. This person just needs to be taken care of. It’s not complicated, and it shouldn’t be this radical idea. We should just join the rest of the free world. I think we will, I think we’ll have Medicare for all within eight years. Just every day there’s more and more Democrats onboard. Beyond Medicare For All, what do you see as the future of the Democratic Party? I think that the Democratic Party needs to go back home, which means representing working class families, not crazy fringe things, not the hypocrisy of taking money from pharma and then fighting for health care. They need to go back home. They need to go back away from big money and go towards big organizing. They need to go back to the people. That’s how Democrats will win. That’s how AOC won. It’s not big money. We don’t need millions of dollars to run for office. If you’re lazy you do, which is all of these people running. They’re all lazy. I mean, Democrats used to win over union workers and working class people. And we just need to get back to that point. Just like everyone else, I want an ethical representative, too. And I just, I’m hoping that in 2020 we don’t just see this huge wave in 2018, we see an even bigger wave in 2020. I’m part of a record number of women running this year, but I would love if I was beaten next year by another record number of women running. Caitlin Cruz is a reporter based in Dallas. Correction, 2:00 p.m.: This post initially said Fagan’s daughter was named Vanessa. She is named Venice.